Like P.F. Chang’s lettuce wraps? Try these! 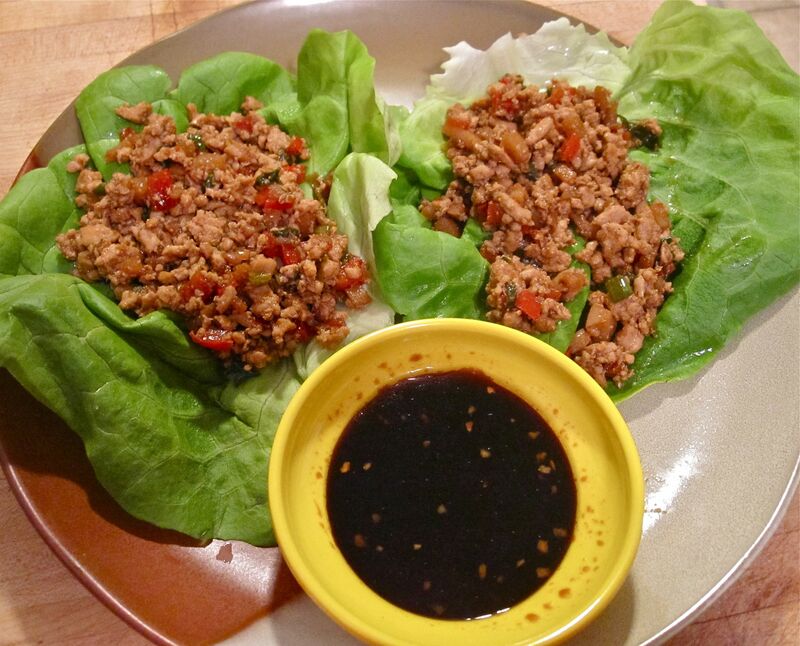 Last week, one of my Weight Watchers members gave me a recipe for lettuce wraps. The recipe was supposed to be similar to P.F. Chang’s signature lettuce wraps. Well, I am here to tell you…they were DELICIOUS! And yes, very close to the ones at the wonderful Chinese restaurant. My guess, however, is that these are just a wee-bit healthier! My awesomely, wonderful chef-of-a-husband made them for us today. Because I enjoyed them so much, I thought I would share the recipe with all of you. So, here you go…ENJOY! 1. In a large pan, brown the turkey, breaking up the pieces. Pour into a colander in the sink and drain the fat. Return chicken to pan. When cool enough to handle, break the turkey into pieces until minced. 2. Add the scallions, water chestnuts, red pepper, soy sauce, hoisin sauce, ginger, water and sesame oil. Cook for a few minutes until the scallions and red pepper are soft. Keep warm. 3. In a small bowl, add all the dipping sauce ingredients together and mix well. 4. To assemble each wrap, spoon about 2/3 cup mixture onto one lettuce leaf, top with about one teaspoon of sauce and then roll it up and enjoy! I really enjoy reading your blogs. I am trying to lose weight & have seen a print out for Weight Watchers pantry staples on-line. I am wondering if you would know how I can print a copy of that list to help me get started in the right direction. Thanks! Thanks for posting. I made these but made some modifications. I substituted Jicama for Water Chestnuts and used Tofu because I am a vegetarian. I also used romaine lettuce instead of iceberg. Romain is a little hardier! Can I tell you that these were yummy! I love the vegetarian ones at PF Chengs but these were good too. Also loved that these were WW friendly-I’m a lifer! You know therefore considerably relating to this matter, produced me personally imagine it from a lot of various angles. Its like men and women aren’t interested unless it’s one thing to accomplish with Woman gaga! Your individual stuffs excellent. All the time take care of it up! Next Next post: Disgusted and appalled!